We had some exciting new players in this week’s NY Masters. Along with 3 GM’s (Yudasin, Stripunsky and Ibragimov), we had reigning World Under 18 girls champion, the German IM and WGM, Elisabeth Paehtz. We also had two new female players in the competition, as Georgian WGM, Tea Lanchava-Bosboom is in town and decided to check out the action. Also joining us was new USCF Executive Board member, Beatriz Marinello. Our third and final new competitor was 23 year old Radu Murgescu, originally from Romania, but now living in Ithica, New York. 4 Shtivelband – Paehtz LIVE GAME !! The first round results are extremely deceiving, as despite there being no upsets, some of the higher rated players were in dire trouble. All of the GM’s managed relatively painless victories, but it was not so simple for Braylovsky and Lanchava. Braylovsky had bishop and three pawns versus rook and three pawns, and basically a lost position. Marinello must have been unaware that in such situations, where time trouble is happening, to never put your rook on the same color as your opponents bishop. She did that, and after Braylovsky attacked the rook, blundered it in the ensuing time scramble. Meanwhile the rapidly improving qualifier, Marajudin Daftani (he was rated 1900 a few months ago and is now over 2100! ), had WGM Tea Bosboom Lanchava dead to rights, as his powerful knights were tearing apart her position. In desperation she sacked an exchange, but it should not have been enough. Unfortunately for the qualifier, he made some missteps, and Lanchava was able to pull out the swindle. 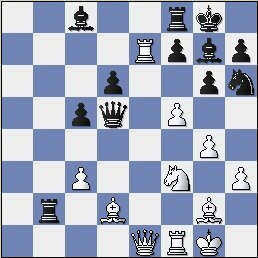 Marc Esserman had a nice position against Jay Bonin, with two pieces against a rook, but was unable to win it in his time trouble, but was able to at least hold the draw. Now lets check out the action between 21 year old NM Richard Shtivelband and 18 year old WGM Elisabeth Paehtz. Paehtz’s favorite variation of the Najdorf defense, which she has been playing for many years. She wanted to reassure all the chess.fm listeners that …h6 is actually one of the most popular lines, and that it was not a mistake! I can only imagine what kind of bold comments I would err in making if I had to comment on a game that was some kind of main line Slav defense. Paehtz was moving quickly and confidently up to this point as she had used almost no time, compared to her opponents 10-15 minutes. She later admitted to me that she had played this game before up to move 18. 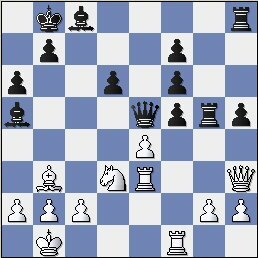 Shtivelband’s last gasp was probably to take the pawn on h6 and hope to attack. It seems as if the attack doesn’t work after 24. gh6 fe3 25. 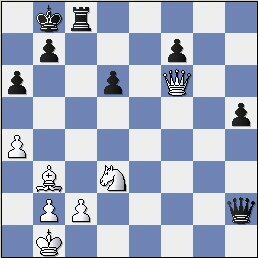 Rg7 Kh8 26.Qf5 Nf6, but sometimes you have to make your opponent calculate a variation when they have a winning position. Lots of players get lazy in winning positions and would rather allow their opponent to get some slight improvement in their position in order to avoid any risk. Paehtz even admitted she probably wouldn’t take the piece, and would have played …g6 instead, maintaining a clear, but not instantly winning advantage. In the game white has no hope to survive. 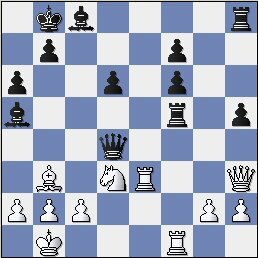 24.Bxf4 hxg5 25.Be3 Ne5 26.Bd4 Bf6 27.Rd3?! Oops…big mistake by Shtivelband, but it’s always best to make such blunders when you already have no chance to survive. A clean and impressive display by Paehtz, who had 19 minutes remaining on her clock at the end of the game. 1 Paehtz – Yudasin LIVE GAME! We had some more wild action in round 2…. Stripunsky was outplaying Lanchava throughout the game, when she made a valiant attempt at a comeback, getting the position to Rook+ 2 pawns versus Rook+knight+pawn. However she couldn’t go all the way, and Stripunsky eventually picked off her pawns and scored the victory. Braylovsky looked as if he would take advantage of his first round gift victory, as he was brutally attacking Ibragimov. 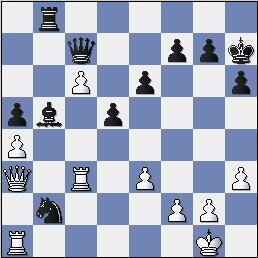 The game looked hopelessly lost, but Ibragimov defended in wizardly style, moving his black king all the way from d7 to g4, avoiding mate from Braylovskys queen+rook. Braylovsky shook his head and he could find no way to finish off Ibragimov, and used the queen to force perpetual check. We had all the makings of an exciting matchup on board one, as young German phenom Elisabeth Paehtz would square off against the NY Masters champion, Leonid Yudasin. A very thematic idea in this opening, as it’s nearly impossible to evict the queen from e5. 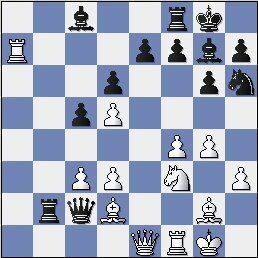 Both players had used very little time up to this point, showing very strong understanding of such Sicilian structures. Now Paehtz begins a long-winded plan to kick the queen off of e5, but will this plan take too long?? 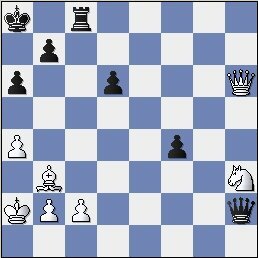 A tactic based on the undefended position of the white rook on e3. 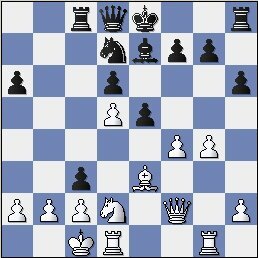 Unfortunately for Yudasin, he forgot to take into account the undefended position of his bishop on a5. 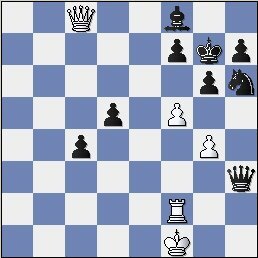 As is usual for strong GM’s, things work out anyway, as black wins enough pawns to counteract the loss of two minor pieces for the rook. We have a long and exciting struggle up ahead, as Yudasin will try to use the pawns in the endgame, while Paehtz tries to use her pieces to attack the king in the middlegame. White had a very interesting attempt at this point, of which I made the bold claim that it was completely winning. I was wrong as is often the case…. I saw that after 37.Qxd6!? Qxh3 38. 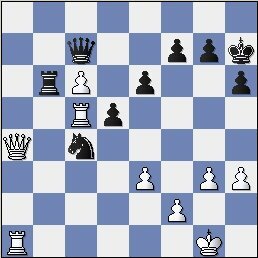 Bd5, black has problems, as white is threatening Qxa6+. If black plays the blunder 38….Ka7, white wins with 39. Qe7! Rb8 40. Qc5 Ka8 41. Qb6 Qf1 42. c4. 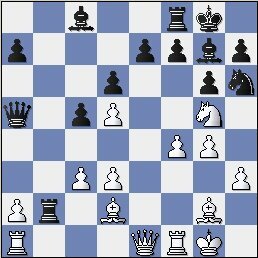 The bad news is that on move 38….black should forget about the a6 pawn, and simply defend b7 with 38….Qh7, giving black a healthy advantage. 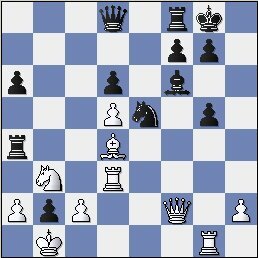 This move forces a draw, but most likely white had no better choice, as the knight on h3 was very unpleasantly pinned. 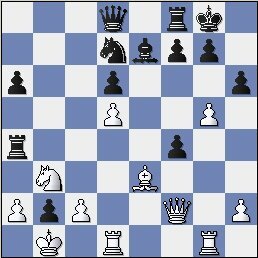 When black captures the bishop on d5, white immediately picks up the rook with Qg8+. An exciting, action packed game by two very fast players! They both had over 10 minutes on the clock at the end of this one! 2 Ibragimov – Paehtz LIVE GAME! We had a dissapointment in round 3, as Yudasin gave Stripunsky a quick draw, despite being a half point behind. The NY Masters has plans to make quick draws illegal if our weekly sponsorship becomes more than $500. The Generation Chess International set a great example, and hopefully this planned rule change will encourage more people to donate to help get to that $500 mark! 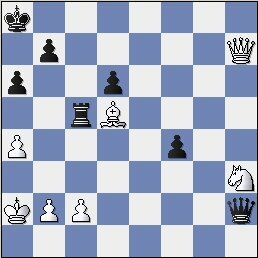 This quick draw was very helpful to Stripunsky as he now had 2.5/3 with the white pieces due in the final round. 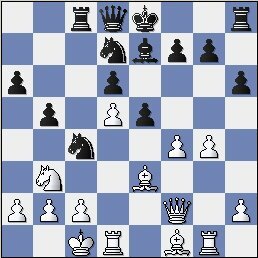 Braylovsky would be joining him in the lead, as he did a real number on Jay Bonin, using an unstoppable passed pawn in a rook+bishop endgame. Once again Paehtz would be playing on the internet board, but would she continue her fine play? 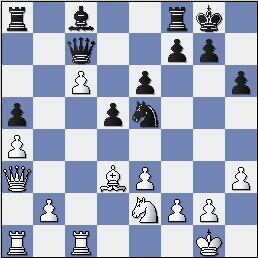 1.d4 d5 2.c4 c6 3.Nf3 Nf6 4.Nc3 a6 5.a4 e6 6.cxd5 cxd5 7.Bf4 Bb4 8.Qb3 Nc6 9.e3 Qa5 10.Bd3 0-0 11.0-0 h6 12.h3 Qd8 13.Ne5 Bd6 14.Nxc6 bxc6 15.Ne2 c5? In a seemingly quiet position, Paehtz makes a grave mistake. Ibragimov perhaps lulled her to sleep with his seemingly passive opening, and his strategy paid off, as Paehtz overlooked an elementary pin. A bolt from the blue. It somehow took me about 10-15 seconds to figure out what the hell Ildar was doing. A great deflection tactic, as the king is the only protector of the f8 rook. Now Paehtz is completely lost, and Ibragimov should join Stripunsky and Braylovsky with 2.5/3. 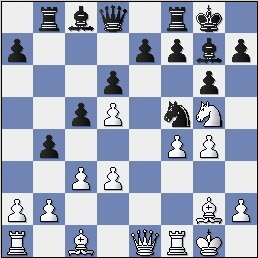 Qxb2 should be a pretty simple win here. 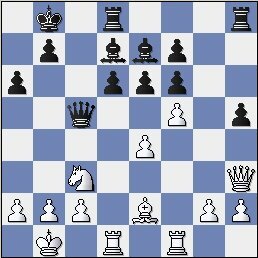 If black tries 27.Qxb2 Bxa4 28. Qxb8 Qxb8 29.c7 Qc8 30.Ra4 decides the issue. Unbelievable! Paehtz has managed to confuse Ibragimov and now his rook is trapped! Ibragimov could try to keep fighting with Rb5, but discouraged by his lack of time, and Paehtz’s fantastic defense, he decided to call it a day. A heartbreaking draw for Ibragimov and an impressive display of fortitude by Paehtz. This means that Stripunsky and Braylovsky will be fighting for first place in the final round. There was huge controversy in the final round, which needs to be discussed at length. In the final round, Ibragimov was extremely unhappy with the pairing. The pairing came out so strange, because Paehtz played both Yudasin and Ibragimov, and the only way to avoid having the two GM’s play in the final round would be to drop Paehtz down to a 1.5, instead of dropping one of the 2200s. This is an extremely difficult pairing decision, which according to the rulebook, says that the pairing that was used in the tournament was the correct and legal pairing. Let’s not even discuss whether or not the pairing is correct but think about what is going on here. First we have a tournament, where the organizers/tournament directors don't make a penny (and in fact, are sponsors themselves, paying for all expenses out of pocket, and contributing money to the prize fund) and are donating their own time, energy and money for the good of chess and for Grandmasters. Secondly we have sponsors donating very generous sums of money to make this tournament possible. Thirdly we have about 5-10 minutes to make a pairing, and we can’t hold up the round for exorbitant amounts of time to discuss the advantages of one pairing over the other, especially when the computer (an OBVIOUSLY unbiased source) and the USCF rulebook prefers one pairing. If a player wants to insult the sponsors, the directors and all the other players in the tournament by forfeiting their last round game, in which prize money is involved, then they are simply not welcome back. Back to the tournament….. Paehtz and Yudasin end up with 3/4, and thus are hoping for a draw between Stripunsky and Braylovsky. You can be sure that Stripunsky has no intention of drawing, as he finished with 4/4 last week and plans to extend his winning streak to two New York Masters against the much lower rated Braylovsky. Meanwhile Braylovsky hopes to become the first under 2400 player to win the event in a year, since IM Jayson Gonzales (who should have never been under 2400 in the first place) achieved this feat, last summer. And the knight is relegated to benchwarming status on h6. 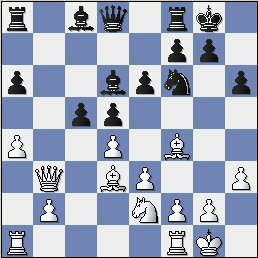 It’s usually not good to play without one of your pieces against a GM, but perhaps Braylovsky can drum up some play on the queenside. A nice move by Braylovsky, keeping the bishop pinned on d2, as the g2 bishop is now attacked. A peculiar move by Stripunsky, giving up a pawn for seemingly no purpose. 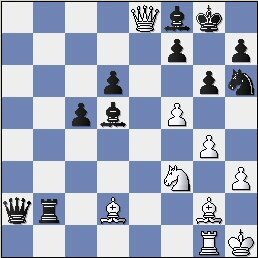 IM Bill Paschall at chess.fm couldn’t explain this move, and I’m sorry to say that I can’t be of much assistance. I Suppose the idea must be to give access to e8 to the white queen, but this really serves no purpose. The queen arrives at e8, but at a huge expense, as black has a simple move that wins 2 pieces for the rook. It’s just a matter of tecnique here folks, even with a 200+ rating deficit. It didn’t help matters that Stripunsky had only 3 minutes left whereas Braylovsky still had 10 minutes remaining. Stripunsky calls it quits, and Braylovsky wins clear first place and $350! Braylovsky took full advantage of his opponents round 1 slip-up and parlays it into his first ever first place finish. Being that he was clearly the best dressed for this week’s event, I’d say he deserved the prize. Tied for 2nd place with 3/4 were Leonid Yudasin and Elisabeth Paehtz, good for $100 apiece. There was a 3 way tie for Under 2400 as Lanchava-Bosboom, Murgescu and Esserman all finished with 2/4, and received $35 each.